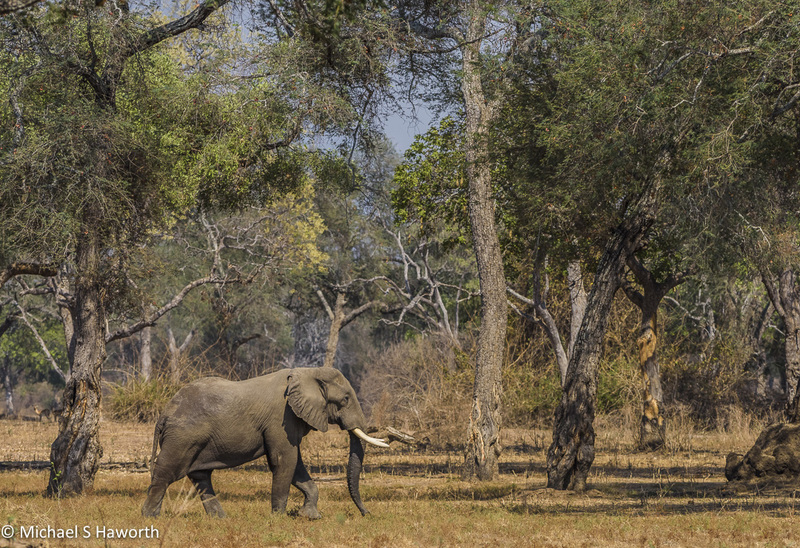 Mana Pools, on the Zimbabwe side of the lower Zambezi river, is hot in October. One needs to get up early before the furnace is lit. When waking up at 4h45, you find the bird life is already very busy. One of the early morning sounds one hears is the booming pre-dawn chorus of distant Southern Ground Hornbills. It is a wonderful time of the day. It is as cool as it gets, and the bush is in flux as the night shift is home bound and the day shift is stirring. After the prerequisite cup of coffee and a rusk, we were out of camp by 5h30. We were wide-awake and brimming with expectation about what the day would bring. 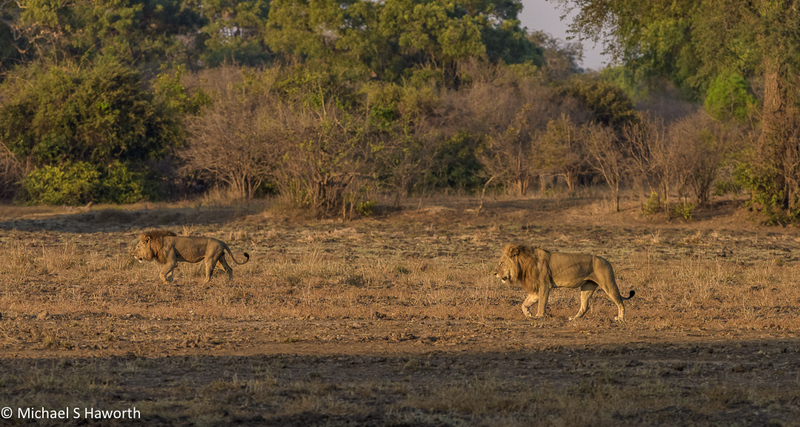 Early deliverance was seen lying close to the left hand side of the road, a large male lion – unmoved by our presence. We watched him for quite a while as the sun rose. He was relaxed, but just before getting up he began licking his paw, probably trying to remove paper thorns with that rough tongue of his. Eventually he got up and walked over to his comrade in arms, possibly his brother. They rubbed heads as a greeting. This is quite a moment as here we have two primal 250 kilogram male lions. If they were to compete there would be an almighty battle and one, or perhaps both, would be mortally wounded. Yet they cooperate and work together to form a powerful team. Africa, you could learn a lesson from these two! It was early morning, still cool when the kings decided to move off. The look back was poignant – I know you are there! Our experienced guide, Kevin, had a good idea where the male lions were likely to go. 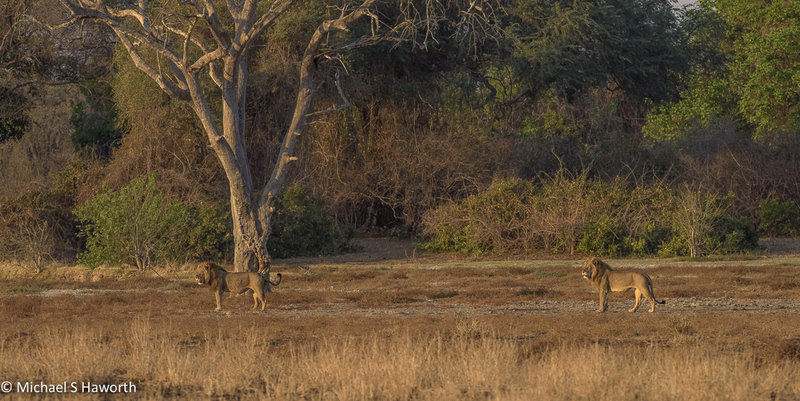 We drove a few hundred metres, and there, walking parallel to the road, we found the kings in an open area on their way towards a thickly wooded area, probably looking for somewhere quiet and cool to rest away from the glare of humanity and possibly what could have been a busy night. We got off the vehicle to walk parallel to them, closer but a respectful distance so as not to disturb them. Just looking at them, they exuded power and the confidence knowing there were few challengers. The long shadows show that it was still early in the morning and the light was clear and soft. Confident and powerful, but ever alert. When you are on the ground way away from your vehicle, the scales are tipped. 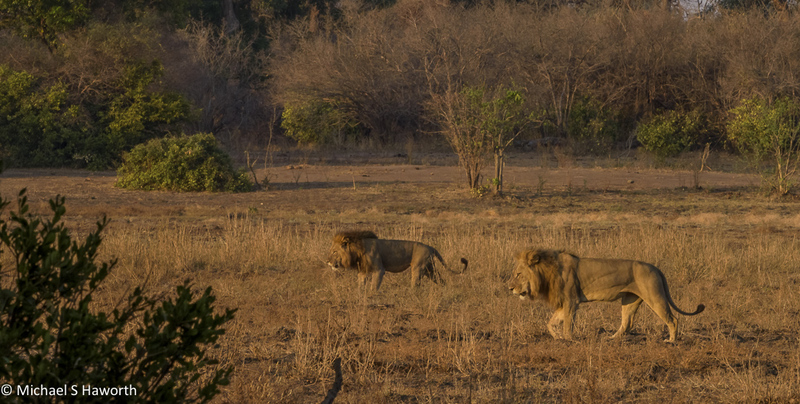 In the presence of a coalition of male lions, there is an aura of respect and reverence. The bush seems to go still as if holding its breath until they pass. Once the kings had moved out of sight into the forest to rest, there are no words. We just stood still, quiet just taking in what we had just experienced. After a while, still prickling with the excitement we went back to the vehicle, then wandered back towards the river. The huge open vistas were soothing and reminded us that this was a vast complex environment. Mana river flows gently into the mighty Zambezi on its way to Mozambique and the Indian ocean. Further inland, the floodplain was drying out. A herd of waterbuck were taking advantage of the remaining moist vegetation. The further away from the river we went, the drier it became. A herd of buffalo on the move, with their rumbling hooves spewing dust. Having driven back into the forest, we watched this large bull making his way toward the river. He stopped in the shade under an Ana tree to pick the seed pods off the lower branches. The next scene gives you a sense of the the enormity and diversity of the scenes in this amazing nature wonderland. Back down by the Zambezi river, it was lush with blues and greens and much fewer oranges and yellows. Driving back towards the Trichilia area looking through a grove of Ana trees across the Zambezi river into Zambia. When you look into this enchanted forest, the light dances and stirs your imagination. In the mornings, depending on the direction of the sun, there is a blue haze in the Mana forest. 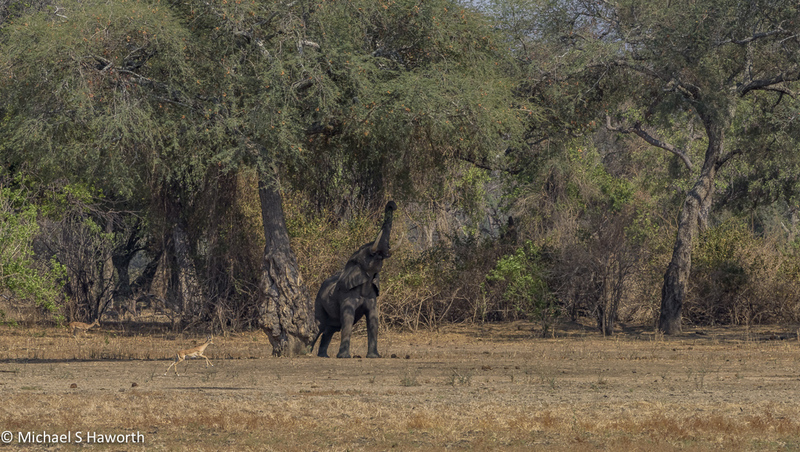 This is one of the unique, much sort after features of Mana Pools, especially for photographers. It was early spring so the ground was dry. The only greenery was to be found in the trees and along the banks off the river and pools. What you don’t expect is the blue haze in the forest. A female eland and an impala ram were grazing on what could only be crisp shoots of grass. 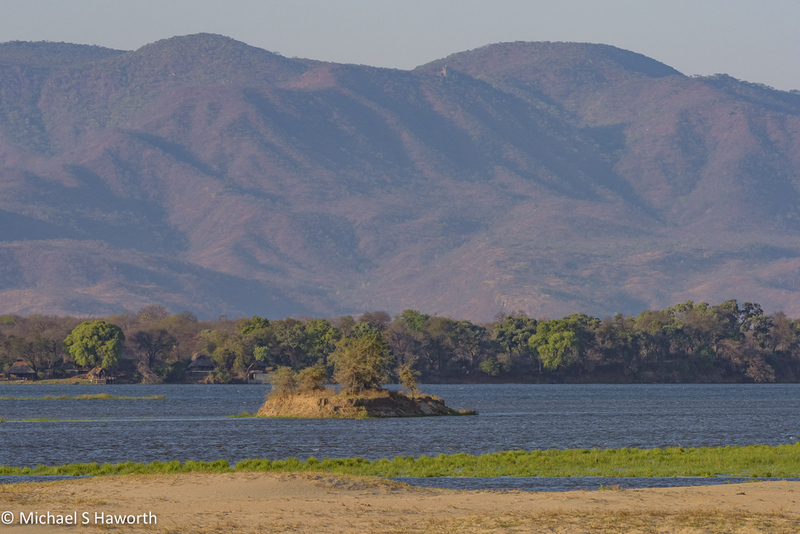 Down on the floodplain next to the Zambezi river, a sand island stands defiant in the slow moving river. On the other side of the island is the Zambian side of the river and escarpment beyond that. An adult and young male waterbuck walking on the lower sand terrace next to the river. On the floodplain in front of Vine camp you look out across the Zambezi river onto the Zambian escarpment. (double click on the panorama to see an enlarged image). A two elephants were browsing on the vegetation in front of one of the covered tents in Vine camp. A couple of hundred metres in front of Vine camp, we watched the family herd of elephant quietly browsing in the beautiful late afternoon light. One of the elephant cows was known to be particularly aggressive, so we kept our distance to show respect and not to threaten her or her family in any way. 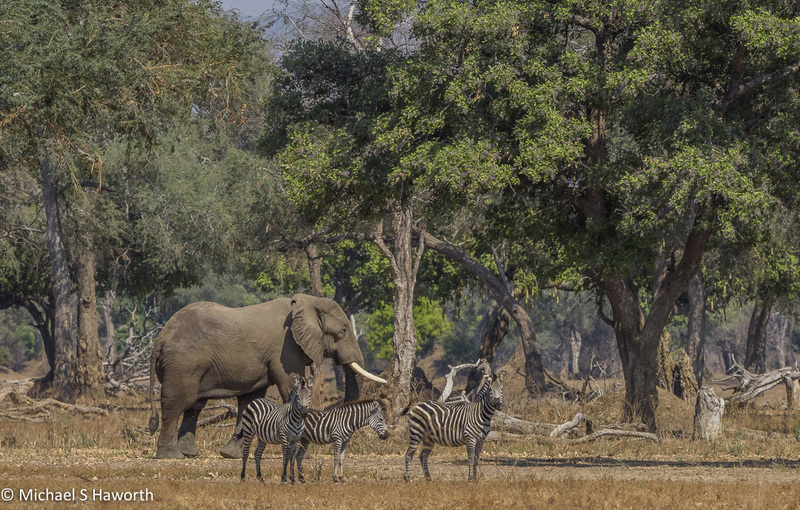 Mana Pools is known for its eclectic and colour-filled scenes. The wildlife is abundant. 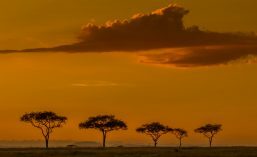 With beautiful landscapes and abundant wildlife what more could a wildlife photographer want? What a marvellous experience this must have been for you and your companions. Your photographs are beautiful! Thank you Anne, Wishing you a wonderful 2018!